Some great books I've used at school are NOT written in English! Go to TPT and check out my unit plans for Heidi, the Moomins, Mio's Kingdom, Mrs Pepperpot, the Tales of Jules Verne, Nicholas and others! As someone who grew up in the70s I have no love for Richmond or it's supporters at all. Nobody who grew up then could. Of course I couldn't give a damn about Adelaide so looks like I'll be washing the car this afternoon. I'm more interested in trade week to see how Essendon handles that. I hope they pick a good midfielder to help out Merret. Below are some random pics and thanks for the 123000 views!!! Also selling lots on TPT lately which is great. I love sharing my work and making some pocket money. This dog is my hero! Dudes in dresses telling us how to vote. Found these little gems at 'Heroes Inc' in Ballarat yesterday. A Jack Kirby Twitter site is also publishing some of his iconic art work. DeVos speech at Harvard of all places. Betsy DeVos is at it again. Americans want public schools for their communities. Billionaire, BetsyDeVos chooses charters & vouchers to enrich her hedgefund friends. Disgusting. Protesters disrupted her 'pro- choice ' sham speech. Well done. Find below a link to my recently completed Wind in the Willows unit plan. 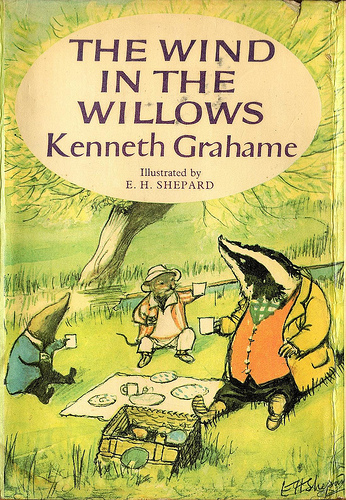 A Blooms Taxonomy literature unit plan for the classic Kenneth Grahame tale. this unit includes puzzles, graphic organisers, project ideas, reading comprehension and craft ideas and templates. Loads of fun can be had with this fantastic story. This week is Banned Books Week, the week we celebrate having the freedom to read whatever we want. Did you know that even children’s books are challenged sometimes? It’s true. You might wonder why anyone would try to ban a picture book or a young adult novel. It turns out that there are a whole lot of reasons, including parents’ desires to protect their children from things like magic (the Harry Potter series), scientifically accurate sexual education (Where Willy Went), and even depictions of people at the beach (Where’s Waldo?). The American Library Association keeps a list of frequently challenged children’s books based on reports from schools and libraries across the United States. In many cases, children aren’t able to have access to these books at home, so it’s crucial that schools and libraries are able to keep books in circulation and preserve access for all children. And if today’s youth are anything like I was as a child, knowing that a book has been banned or challenged just makes it infinitely more compelling. I made my submission to the Commonwealth inquiry into rural/remote schools ( The submission can be found in 'Resources' on the Glen Park website.) and will be attending one of their forums in Bendigo on the 10th October. This news is of course NOT NEWS to me. DET ( both Victorian and Commonwealth) have been asleep at the wheel for decades on this. There is no Victorian strategy for bridging the gulf in fact DET seem to have outsourced their responsibilities to rural education to the CEP! Students in regional and remote parts of Australia are up to two years behind their metropolitan peers in NAPLAN English and PISA maths tests, and this gap is likely to widen in coming years if major funding and structural issues are not addressed, according to the Australian Education Union. In a submission to the Australian Department of Education's ongoing review into regional, rural and remote education, the AEU has warned that changes to federal funding for public schools will magnify these "issues that confront students in non-metropolitan areas". The AEU represents about 185,000 principals, teachers and other educators. Under the Turnbull government's new funding model, dubbed Gonski 2.0, AEU president Correna Haythorpe said most public schools will not meet the accepted funding benchmark by 2023, and this will disproportionately affect students in non-metropolitan areas. "Across Australia, 87 per cent of public schools will not reach their schooling resource standard by 2023, it's going to have a significant impact," Ms Haythorpe said. "In the country, 70 per cent of children are educated in public schools and we are very concerned that achievement gaps will widen if we do not address resourcing issues." Ms Haythorpe said delays in reaching the resourcing standard will mean that these students will "experience compound disadvantage". This falls to about 21 per cent of children entering schools in major cities. Students with a low socioeconomic status are also over-represented in regional and remote schools, according to the AEU submission. Gae Masters, a NSW Teachers Federation councillor, said that "a funding shortfall risks magnifying the existing challenges that we face". Mrs Masters, who is principal at Kyogle High School in northern NSW, said the school performs below the state average in NAPLAN tests and has issues "with reading, writing, numeracy, spelling, grammar and punctuation". She said the school would ideally "increase professional development for staff to upskill them in delivering a differentiated curriculum [and] employ youth workers" to address attendance issues relating to the high number of students who have part-time jobs. However, Mrs Masters said a lack of resources means she can't seek targeted support for students or cover the costs of sending staff to professional development days in major cities, which add up to as much as $1500 per teacher for regional schools compared to $500 for city schools. "We do well with what we have but it feels like we can just do the minimum," she said. "We're reacting to NAPLAN results and poor HSC results rather than being in a situation where we can be proactive in our educational approach and look at what we can do to lift all students' results." The AEU submission also includes a number of recommendations to address the gap in educational outcomes in different parts of the country. These include the need for "comprehensive workforce planning ... across the states and territories" to improve teacher quality and retention, the need for improvements in initial teacher education, and the need for a far greater focus on improving outcomes for Aboriginal and Torres Strait Islander children. The government's review is being led by Flinders University professor John Halsey and aims to "consider the key challenges and barriers that impact on [country] students' learning outcomes". The final report and recommendations are due by the end of the year. Federal Government funding cuts to public schools will magnify the stark disadvantages already facing regional, rural and remote public schools around Australia, a submission to a government education inquiry has found. ‘The Turnbull plan already concentrates funding shortfalls among public schools. Our submission shows the Federal Government is prepared to heighten that impact for country children, 70 per cent of whom are enrolled in government schools,’ said Correna Haythorpe, Federal President of the Australian Education Union. Schools in regional, rural and remote areas already face learning challenges compared to their metropolitan peers on NAPLAN. International measures of learning progress such as PISA tell a similar concerning story, with 2015 results revealing a two-year gap in maths literacy between metropolitan and remote students. ‘Like the Federal Government’s unjustifiable decision to cap its funding of government schools to just 20 per cent of the schooling resource standard, as it funds private schools at 80 per cent, there can be no reasonable excuse to further discriminate against public schools that happen to be located in regional, rural and remote areas,’ Haythorpe said. ‘The Turnbull Government’s low-ambition, low-growth trajectory for public school funding will fall most heavily on country children. More broadly, many public schools will remain below the schooling resource standard, and an increasing proportion of wealthy private schools above it, even after ten years. ‘Already struggling with challenges around distance, facilities, teacher retention, support services and professional development, rural, regional and remote schools will now have to contend with inadequate funding for longer, and children will bear the brunt,’ Haythorpe said. The union is calling for public schools to be funded at 100 per cent of the schooling resource standard, increasing the proportion of Federal funding to public schools to reflect the Federal Government’s greater revenue-raising capacity, and the immediate reversal of cuts to disability servicesacross public schools in five states and territories. Hard to imagine a planning stoush that's more quintessentially Ah-madale: on one side, the elite girls school Lauriston, on the other, the Armadale Residents Group, campaigning for the right-to-life of old buildings. As The Age reported last week, Lauriston wants to raze its Federation-era Sutherland House for a $23 million "sports and wellness centre". Did anyone else do a double-take here? Not about the threatened house, but about the proposed new centre: $23 million. Then again, Lauriston's revenue last year was almost $35 million so why be surprised? The news underscores how such bastions of privilege bequeath their students an unconscionable head-start in life. If you think that's a cheap shot, consider that last year the school pocketed taxpayer dollars amounting to almost 10 per cent of its total income (in 2015, the figure was about $2.5 million). Small change, by elite private school standards - which is precisely the point. If you harbour even the weakest egalitarian impulse, this gifting of public money to rich schools adds insult to injury. The Turnbull Government's Gonski 2.0 school funding reform leaves intact the elite schools' entitlement to the public purse, merely tinkering with their pocket money. Astonishingly, Labor outdoes the Coalition in affirming the elite schools' right to a handout. And these schools get their cash with no meaningful quid-pro-quo, no equivalent of household chores. The free pass persists even as these institutions grow bigger and metastasise in Melbourne's highly-coveted middle-ring suburbs. I cannot weep for Sutherland House; while apparently a "fine and highly intact" example of its time, the building is no lay down misere for heritage listing. (The planning tribunal will decide its fate.) One outraged resident alluded to the sentiment that the wrecking ball ill-becomes an institution such as Lauriston. It was reported last year that private schools were locked in a facilities "arms race" to lure students, outspending public schools four-to-one on capital works projects, such as rowing tanks, pilates studios and sky decks. Presbyterian Ladies' College (nearly $7 million in 2015) in Burwood recently unveiled a $30 million auditorium with a "black box" studio for drama classes and performances. Carey Baptist Grammar (more than $7.5 million in 2015) in Kew boasts a new $23 million "learning and innovation centre", with an audiovisual "Imaginarium" and "United Nations Room" with city views. What's with the references to "city views?" It's as if these schools are promoting not education but luxury real estate. Much the same observation was made in the UK by former Tory education secretary Michael Gove. In a column in February, he noted that five-star hotels would struggle to offer the state-of-the-art sports and entertainment facilities provided by private schools for the benefit of "children of plutocrats and oligarchs". He argues private schools should no longer be able to claim tax breaks as "charitable institutions," and the government should use the extra revenue to boost standards in state schools. While the UK has a different education system to Australia, it's still fascinating to observe how over there in this populist moment the two sides of politics compete on anti-private school rhetoric, with calls for elite schools to be stripped of their charitable status unless they sponsor state "sister" schools, offer more bursaries and open their facilities to the public. Did that last suggestion arouse your curiosity? Consider this: Australia's elite schools collect taxpayer dollars, which indirectly helps fund ambitious capital works programs, which in turn further increases the schools' revenue streams because they attract more students and also get to hire out their "world-class" facilities to third parties for profit. Otherwise, these facilities are fenced off as "private property" and swept by surveillance cameras. One logical quid pro quo for public funding would be compelling the schools to offer their tennis courts, ovals and pools to the public on weekends and holidays at low or no cost. I bounced the idea around with Ian McShane, Senior Research Fellow at RMIT University's Centre for Urban Research, who wants to see better integration between education and urban planning systems. "It's a very legitimate question," he said. "To what extent do these schools consider themselves part of community life, part of the urban fabric?" The idea of forcing rich schools to open their gates has some moral appeal. Though, speaking personally, I doubt that a Sunday arvo on the manicured grounds of the antipodean Etons would do much for my wellness. Saw 'It' with my daughter and I have to say I didn't find it that scary at all and it was too long. I only vaguely recall the previous version but it might be good to find that and watch as a comparison. The Hobbit was published 80 years ago today. My unit plan on it can be found on my Learning With Literature shop on TPT. I'll put Wind in the Willows up on Monday. The last 2 weeks with flu have dragged on. Two weeks off is what I need. I won't be at work for 8 days over these holidays, 3 should be enough. I need a break. We are off to see the Captain Underpants movie at the cinema and then have Party pies for lunch. A nice spring day today. I'll have to get our lush school oval mowed over the break. And.....Tony Abbott leads the No campaign down his avenue of doom! Last day at the pool today. We have made a lot of progeess but will need to go again next year. Parents continuing with swimming over the summer months will help greatly too. The YMCA is a terrific swimming venue except for the over officious nitwit who said I couldn't take photos of my own students in the pool...... We are lucky nonetheless to have it in Ballarat. Heasville Sanctuary excursion next year.